HardTube saw tool - mitre box from the new Eiskoffer set. With this mitre box, cutting HardTubes is a cinch. Its special rubberised channels for 13mm and 16mm HardTubes prevent the tubes from sliding around and getting scratched. The mitre box can be anchored with two small screw clamps. 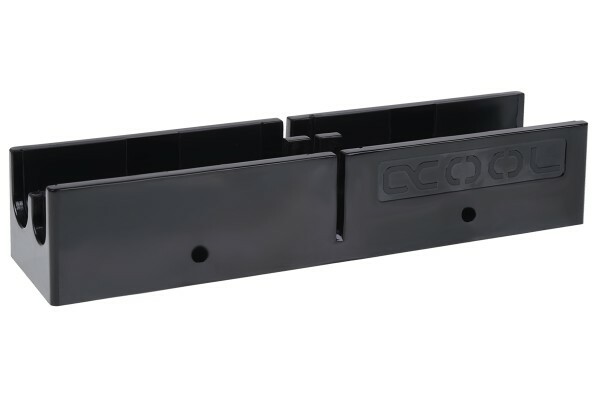 Hi there, does this product come as a package with the screw clamps for anchoring or do they need to be purchased separately? 2 Review(s) in other languages. Mit dem Eiskoffer und diesem Sägehalter bin ich total zufrieden. Es zerkratzt nichts mehr beim Sägen, da der Halter mit so einem Gummi beschichtet ist. Ich finde das ist eine tolle und praktische Erfindung. Sehr praktisches Tool und gewohnt guter Qualität von Alphacool.